On July 16, 1945, if you had been living in Alamogordo, New Mexico, you may have witnessed a great explosion never before seen — the first successful test of an atomic bomb, a fiery mushroom cloud that seemingly sprung out of the New Mexican desert. 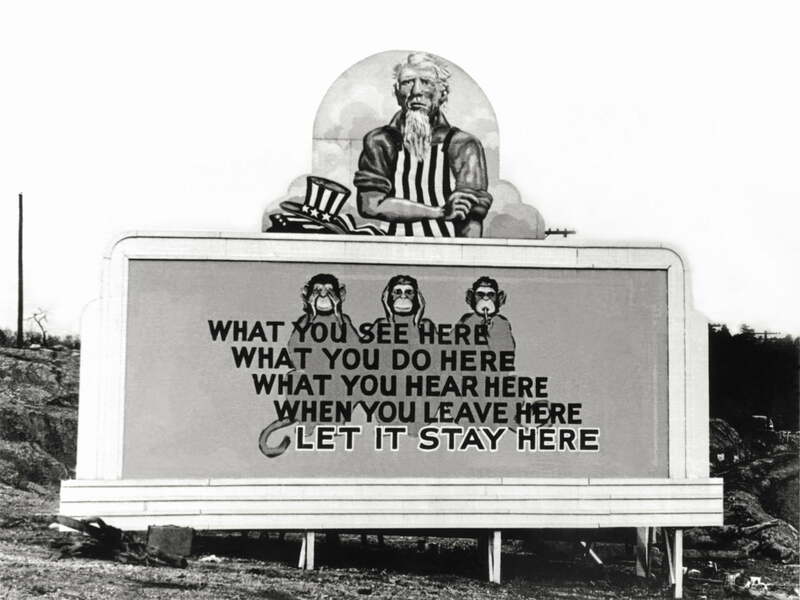 And if you had been living near the test site, codenamed Trinity, you may have been involved with the Manhattan Project, the research and development effort that would launch a nuclear arms race. Women With Byte is a continuing series of articles in which we look at the many contributions women have made to technology — past and present — as well as the hurdles they faced (and overcome) and the foundations for the future they’ve laid for the next generations of women in technology. Those outside Los Alamos, New Mexico had no idea a secret town had been constructed over the past several years. The same was true for two other research facilities, in Oak Ridge, Tennessee and Hanford, Washington, each with thousands of workers. Many of these employees were women, who worked as nurses, lab technicians, maids, secretaries, or instrument operators. Most were unaware what their work contributed to, only that it was for the war effort. But some of these women were scientists, with doctorates and specialized knowledge in physics and chemistry. Working on the Manhattan Project gave them opportunities that would have often been otherwise denied, and helped start to chip away at the many obstacles women scientists faced. But the research they conducted was unproven, highly secretive, and very dangerous. 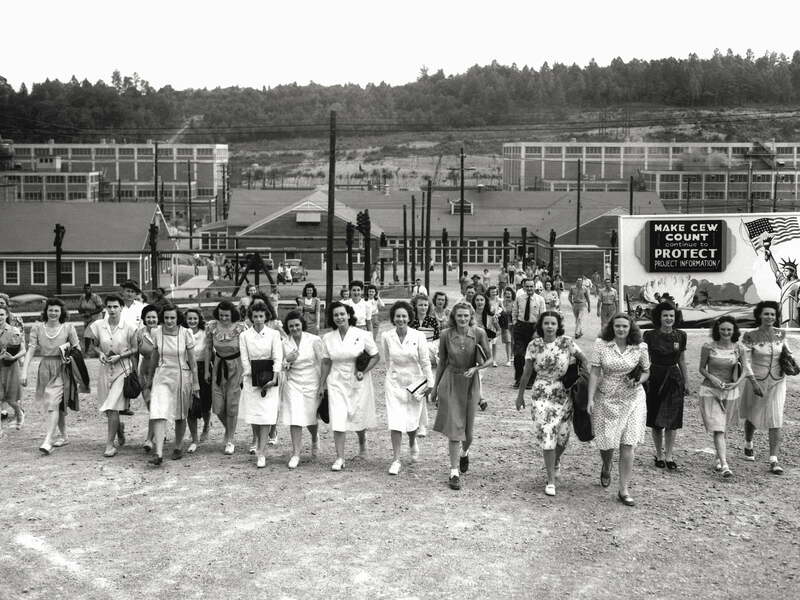 From the scientists who helped developed the first atom bomb to the nurses and laborers who supported them, this is the first half of a two-part piece on the women of the Manhattan Project. Restored footage of the Trinity Test, the first nuclear weapons test conducted by the United States Army on July 16, 1945, as part of the Manhattan Project. Over 40 scientists clustered together on the balcony of the squash court on the University of Chicago campus. Over their heads were the bleachers of Stagg Field. Below was a neat stack of dense, black graphite bricks, some with holes drilled and filled with pucks of uranium. For two weeks, researchers and laborers had been stacking the bricks and forming the uranium oxide powder into spheres, in 12-hour shifts. It was secretive work, but they didn’t have to worry about being interrupted by a game at the stadium; the school’s president had cut the football program in 1939, saying the “infernal nuisance” lowered the prestige of the university’s academics. 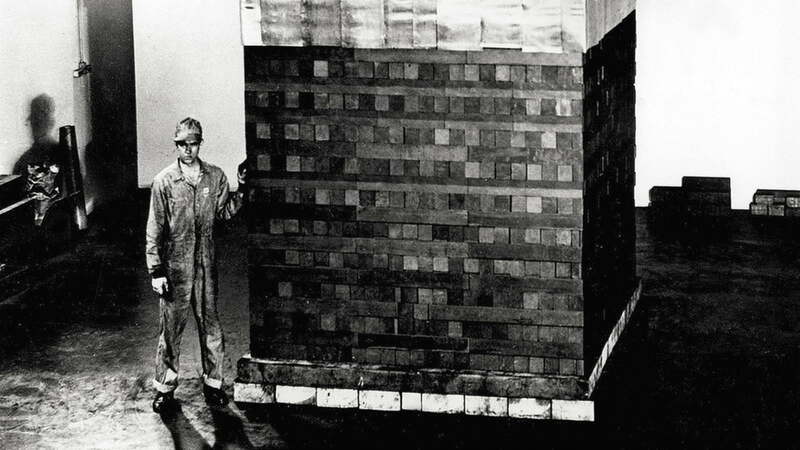 The group congregated on that chilly day in December of 1942, to see if the pile, as the structure was called, would create a nuclear chain reaction. Bit by bit, physicist George Weil pulled out the control rods that were meant to keep the reaction in check. The idea was to have the pile be self-sustaining but not out of control. It took all morning, with the neutron counter ticking away, faster and faster as the levels climbed. Indeed, the Germans had started the research. A few years prior, in December 1938, chemist Otto Hahn wrote to physicist Lise Meitner explaining the results of some experiments he and Fritz Strassmann had carried out in Berlin, bombarding uranium with neutrons. From Sweden, Meitner replied that she found Hahn’s letter puzzling but not impossible. The chemists were concerned Irène Joliot-Curie was on their same track and immediately sent a paper to be published, claiming uranium had been changed to a totally different element, barium. A copy went to Meitner. Over New Year’s, Meitner and her nephew Otto Frisch, also a physicist, went out to get some exercise. As he glided on cross-country skis, she kept pace. What if the force of the neutron caused the uranium’s nucleus — if it had the constitution of a liquid drop — to elongate, narrowing at the middle until it separated? After some calculations, the math checked out. Shortly thereafter, Frisch would do experiments to confirm that nuclear fission was, in fact, possible. The news spread quickly in 1939. Six years earlier Leo Szilard had postulated that a phenomena like fission could set off a chain reaction, where the energy created by one triggers the next. Such a thing could be used in a weapon. The Hungarian physicist, who’d left Berlin in 1933, the day before the Nazis closed the borders, didn’t want Germany to have such a potentially destructive bomb. The forced exodus of hundreds of Jewish scholars, including Edward Teller, Hans Bethe, and Szilard, left the German scientific community weaker, but there were still people capable of capitalizing on what Otto Hahn began. The University of Chicago’s Metallurgical Lab (Met Lab) was just one branch of the Manhattan Project, whose roots slithered from coast to coast and up into Canada: Oak Ridge in Tennessee, Hanford in Washington state, Los Alamos in New Mexico, not to mention universities from Columbia in New York to the University of California in Berkeley. The Met Lab got up to speed in February 1942, just two months after Pearl Harbor. 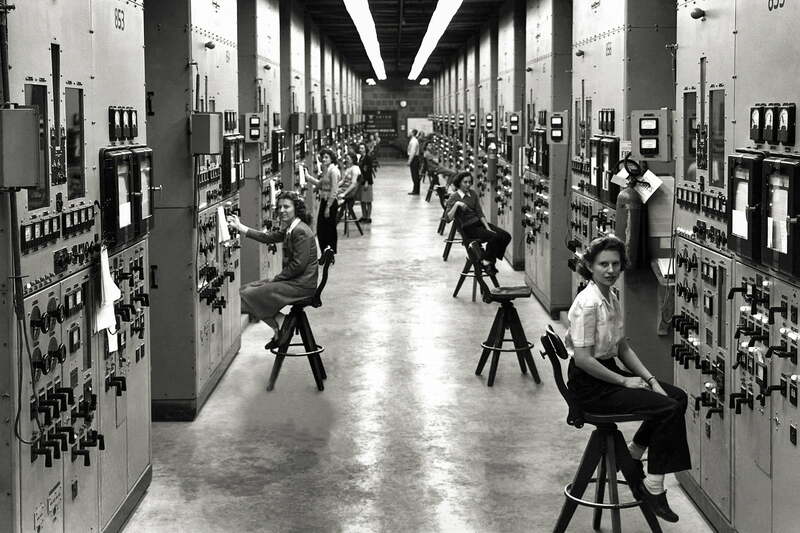 To get the bomb before Hitler, the Manhattan Project needed a massive workforce. Between 1931 and 1940, U.S. colleges and universities awarded 14,476 doctorate degrees to men and 2,040 to women. Even if these had all been science-related, there were other wartime projects, like radar, that required physicists, chemists, and biologists. But Fermi was a star, and the physics community was well-connected. People started showing up. The line from atom to bomb wasn’t straight or clear. There were several problems and even more proposed solutions. What was needed was a way to enrich uranium, a place to purify plutonium, and an isolated locale to design and build the bomb. In Berkeley, Ernest Lawrence had a cyclotron that he thought could be reconfigured from its original atom-smashing purpose. Harold Urey at Columbia University proposed gaseous diffusion. Jesse W. Beams worked on a gas centrifuge method that seemed promising. While those three options were focused on uranium, at the Met Lab Arthur Compton was working with plutonium, which he believed could also fuel a bomb. James B. Conant, president of Harvard and scientific adviser overseeing the project in 1942, wanted to chase them all. If both American and British scientists could see the many routes to the weapon, he figured the Germans could, as well. With over 2,000 people working on the project, secrecy was strictly enforced. 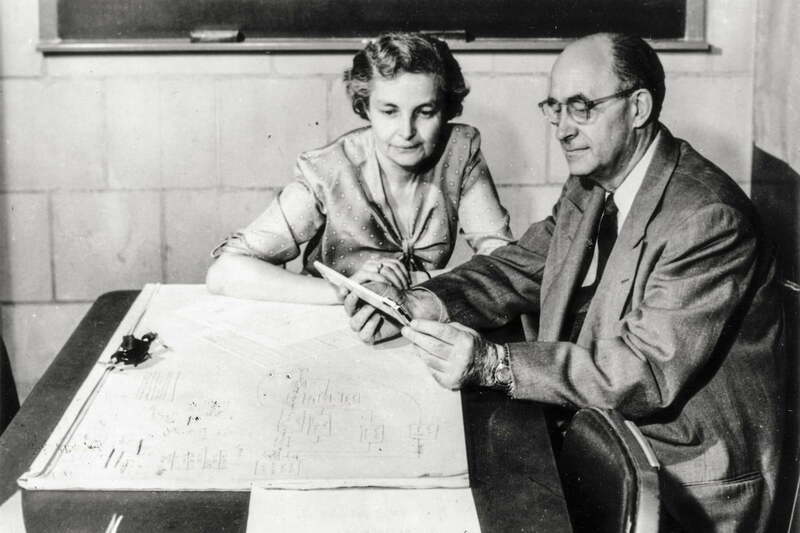 Fresh off completing her doctorate in physical chemistry, in December 1943, Isabella Karle took the train from Michigan to Chicago to meet her husband, Jerome. There was a job waiting for her in the Met Lab where he worked, though she’d never put in an application. All she knew was she would be working with a new element, “not to be found on the periodic table.” It had only been three years since Glenn Seaborg first produced the silvery, radioactive metal, and no one knew much about it. Researchers at the Met Lab started experimenting with it, trying to learn about its behaviors and characteristics. Using a reactor, they hoped to transmute uranium into plutonium, then devise a way to separate the two elements. Because of its unknown properties, scientists also wanted to learn about the health effects of element 94, its projected periodic number. It turns out plutonium is a bone-seeker. It accumulates like calcium and can lead to cancer. In an effort to prepare herself, Isabella Karle went to various libraries in Chicago to read up on plutonium, but the closest she could find was information on uranium. Though uranium sits close to plutonium on the periodic table (it’s element 92), the gap between their discoveries was 151 years; Martin Heinrich Klaproth described uranium in 1789. By the 1940s, much more was known about it, including its radioactive properties. When Fermi was building the Chicago pile, scientists were already aware of the difference between uranium that’s fissile and the kind that isn’t. Only the fissile kind would sustain Fermi’s chain reaction. Naturally occurring uranium is mainly made up of two isotopes: U-238 and U-235. But it’s not a fifty-fifty split. The fissile U-235 makes up only 0.7 percent. That’s why so many separation methods were in play in May 1942. Physically uncoupling the two types of isotopes might best be achieved with Leonard’s electromagnetic process or Urey’s gaseous diffusion or the centrifuges Beams was using. By September 1942, the situation was changing. 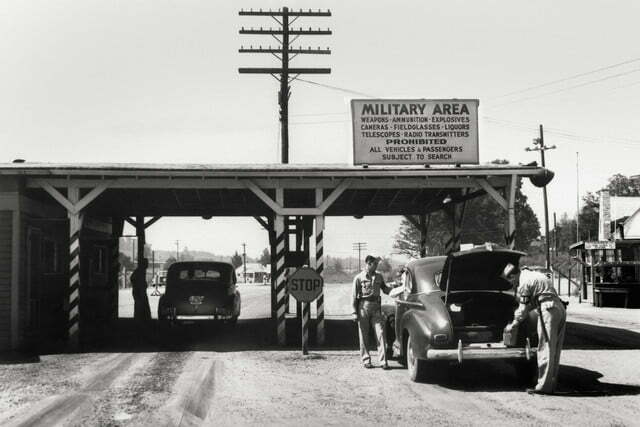 In August, the Manhattan Project became official and a month later General Leslie Groves was in command. 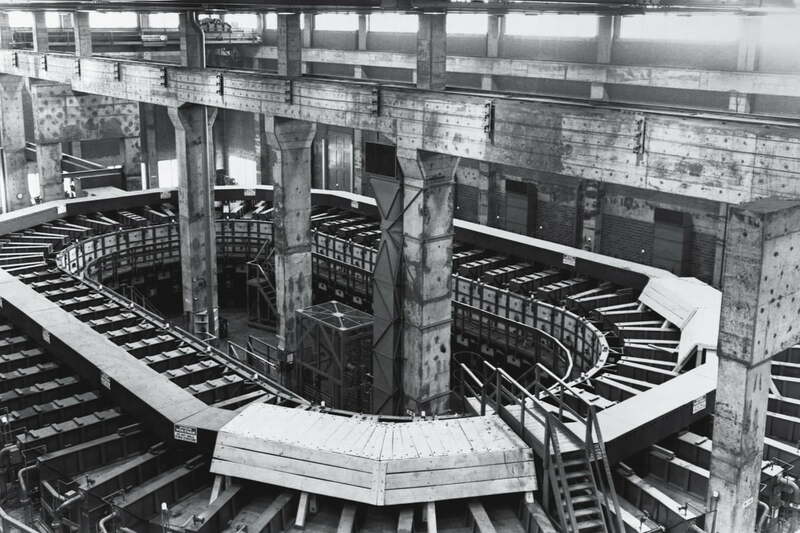 Tennessee was the spot where the project would erect a facility full of Lawrence’s electromagnetic machines for separating uranium, while plutonium research would continue in Chicago. Rose Mooney-Slater was used to scraping by with limited resources and squeezing in research on tight deadlines. 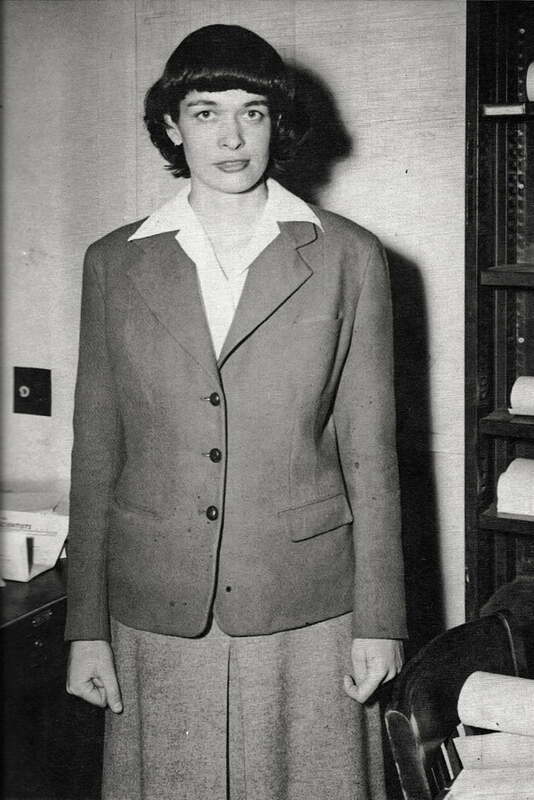 Though she was head of the physics department at Newcomb College, her ability to conduct crystallography experiments was hampered by her school’s lack of equipment. To compensate, she spent her summers at other universities, getting results and publishing nine papers between 1934 and 1938. 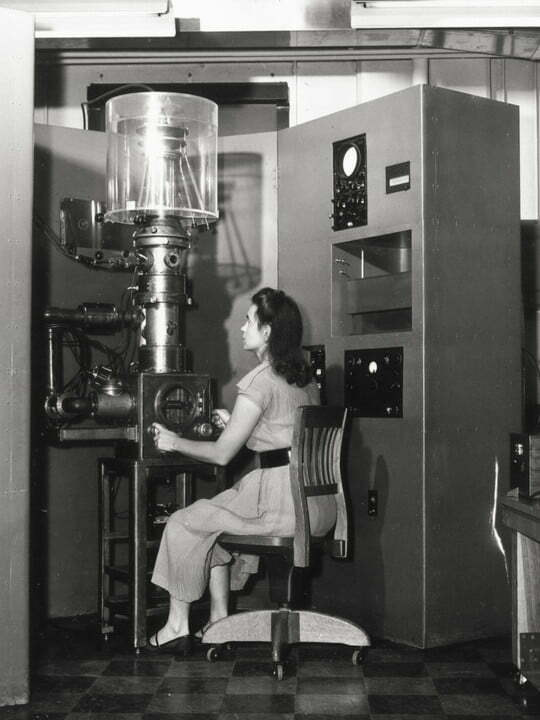 In 1943, William Zachariason, her former instructor at the University of Chicago, brought her to the Met Lab. By this time, Seaborg had figured out how to isolate plutonium but the available quantities of element were very limited. Mooney-Slater spent her time using X-ray diffraction to study the crystal structures of bismuth phosphate, a compound used in the plutonium-separation process. With specialists from chemistry, mathematics, biology, engineering, physics, and more, the work at the Met Lab couldn’t be contained to a single discipline or building. Eventually, the project would occupy roughly 360,000 square feet of space around campus. Site B was an ice house-turned brewery-turned laboratory. Miriam Posner Finkle put her zoology doctorate to use studying the effects of radiation exposure on small animals. General Groves gave her security clearance. This was almost unprecedented. “So we got the message,” Laura Fermi said. Betty Compton, who screened the movie for the wives, was married to Arthur Compton, the head of the lab. Because he was so adamant about being able to discuss everything with her, General Groves gave her security clearance. This was almost unprecedented, unless both spouses were working on the project, like Isabella and Jerome Karle, who studied plutonium at the Met Lab. As she made plutonium chloride, her husband attempted to rid the element of any impurities. Starting with greasy yellow flakes of plutonium dioxide, she transformed them into beautiful, jade green crystals using a high-heat vapor process. 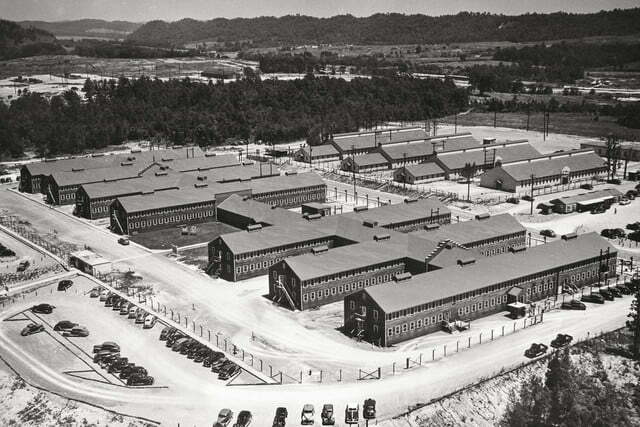 The yellow flakes that were the raw materials for Isabella Karle’s experiments came from the Oak Ridge facility. 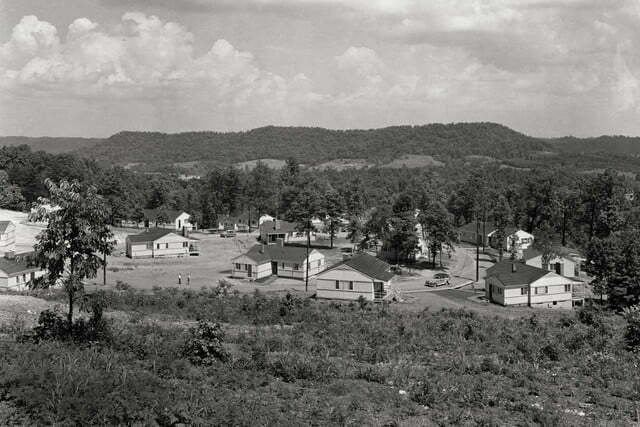 When General Groves decided the area, about 20 miles from Knoxville, Tennessee, would suit the Manhattan Project’s purposes, the government used eminent domain to seize land and displace about 1,000 residents. Reba Justice Holmberg returned to her hometown after getting her bachelor of science degree from the University of Tennessee, only to find the facility had taken over. Her grandparents lost their farm. Some of her neighbors had left with such haste that they’d left their animals behind, and they were now running wild. Residents complained they hadn’t received a fair price for the land. Still, Holmberg and many members of her family, including her grandparents, went on to get jobs at Oak Ridge. After the evictions, what had been a small farming community transformed. It was a massive construction project that involved not only building a graphite reactor, an electromagnetic separation plant, a gaseous diffusion plant, and a liquid thermal diffusion plant, but a coal-fired power plant, housing, and a shopping area. As the population grew, eventually swelling to 75,000 in 1945, tennis courts, bowling alleys, theaters, recreation halls, and other facilities popped up. It was 60,000 acres that you couldn’t find on a map, a secret city. “Of course we weren’t calling anything by its proper names. Absolutely everything had code name or a number,” said Anne McKusick later. “If we were on shift work and we were having to fill the 7-14 traps, we weren’t even much conscious to the fact that this was liquid nitrogen.” Secrecy — paranoia, even — was encouraged and reinforced. One day your coworkers were there, the next they were gone. Rumors swirled that “they talked.” Some Oak Ridge employees were asked to report on others’ activity. If you were being asked to spy, did that mean someone was listening in on your conversations? Eventually, she ended up in the lab working with what she called yellowcake. 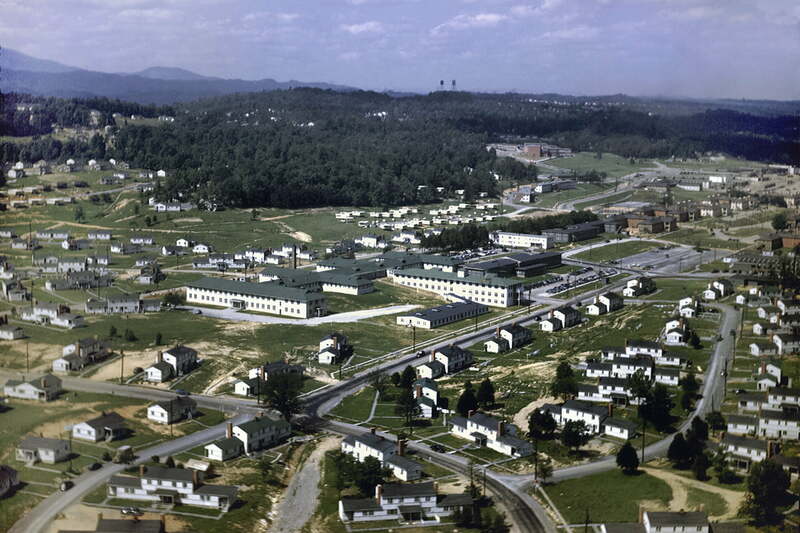 Oak Ridge was growing so quickly that people were queuing up everywhere — the post office, the store, the library. Even when you could get into the shop, chances were the grocer was out of butter, milk, and bill. The list of complaints the town manager received went on, but, he tried to remind residents, they were at war. Construction was constant, trying to keep pace with the expanding workforce. One of the plants, K-25, was a four-story, U-shaped building. Each rectangular wing was half a mile long and 400 feet wide. To cover that much ground efficiently, the foremen used bicycles to get from one end to the other. 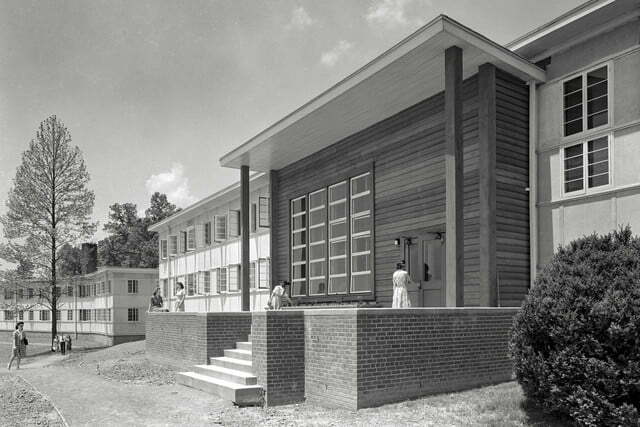 Instead of hutments, African-American nurses and nursing students were “jammed together” in two-bedroom “victory houses” — originally meant for contractors and their families. The women slept in bunk beds, and in one case, the kitchen had to double as sleeping quarters when space was scarce. Nearby Meharry Medical College graduated at least two of the nurses, Geneva Drake and Velma Hurd. There were no single-family homes for African Americans, so there was no way for husbands and wives to live together. Privacy was nearly impossible to come by, as 24-hour shifts meant it was always someone’s bedtime, no matter the hour. As a result, many African-Americans chose to live in Knoxville and commute, especially because there were no schools inside the fences that would admit their children. It took six weeks to get Virginia Spivey Coleman’s paperwork sorted out. The young chemist already had her security clearance, but the administrators couldn’t find it. In the meantime, she had to spend her days in the bullpen with the rest of those waiting for their background checks to be completed. While she was planning on doing lab work, she decided to help some of the other women in the pen. Some were still teenagers. A few didn’t have electricity or plumbing back home. Although Coleman didn’t know exactly what they would be working on, she was told it involved instruments. What kind, and what did they do? In this environment, it was better not to ask. Instead, she patiently explained concepts like gauges, dials, and levers. Eventually, she ended up in the lab working with what she called yellowcake. Using its real name, uranium, was forbidden. Employee badges looked more like driver’s licenses, with each person’s stats — height, weight, age, and eye-color — printed on them. They were color-coded, so it was easy enough to spot when someone wasn’t where they were supposed to be. The women Coleman left in the bullpen went to Y-12, the electromagnetic separation plant. That’s where the calutrons were. These mass spectrometers were modifications of Ernest Lawrence’s cyclotron, and they were used to enrich uranium. Sitting at one for the first time must have felt like an airline passenger entering a cockpit. There were rows of tall metal cabinets, covered in dials, switches, and gauges. Each one did something, but the descriptions were cloaked in code or jargony. Amp up the beam or change the voltage. Empty the E Box. 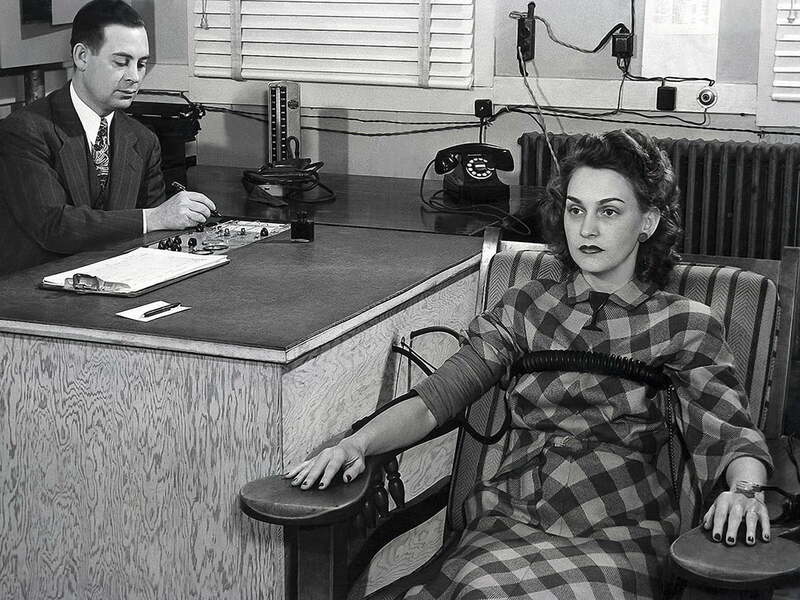 Mostly it was just monitoring the gauges and fiddling with the knob as if it were a radio dial, getting the needle right where it was supposed to be. These women were efficient, cooperative, and perhaps a little bored. They had no idea what was going on beneath their feet, where electromagnets were pulling U-235 and U-238 apart, readying the uranium for an unprecedented weapon that would change the course of human history. This is the first half of a two-part piece on the women of the Manhattan Project. You can find part two here.